If you see a new retractable awning in New Jersey, chances are it came from Patio Shades Retractable Awnings of Bridgewater, NJ, and chances are the business or homeowner customer is very satisfied with her or his purchase. Truthfully, among awnings suppliers in Jersey and NYC, PatioShades Retractable Awnings is the only smart, serious, go-to choice for both comfort in and protection from the nasty and relentless elements of weather. Moreover, you know it’s true what they say: If you don’t like the weather in New Jersey, forget about it. Just wait a few minutes; it will change. The turning point is also our middle name: Retractable. The technology used in the motorized and mechanical awnings products we provide is totally state-of-the-art, so you can be assured the equipment will work properly when you want to roll it on out and when you need to roll it back in. Our awnings – and our full lineup of other shading solution options, including stand-alone pergolas, window dressings and door decorations – are created out of the finest Italian materials and expertly crafted by knowledgeable, experienced awnings-construction professionals in the United States. One of the many facets upon which Patio Shades Retractable Awnings has earned our reputation is by providing our N.J. customers with shades that are durable, attractive, fit seamlessly and work right when you need them to. By overseeing the project with you, you (as the homeowner or businessowner) and we (as the experienced awnings professionals) will ensure complete satisfaction with your retractable awning in New Jersey. Help is always available. 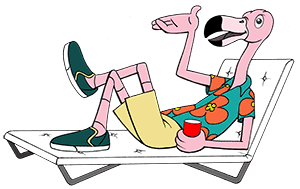 On-line, consult with our Awnings Architect for the style and color that’s right for your property, and get the friendly advice of Frank the Flamingo for your measuring and installing procedures. And, of course, PatioShades is just a click or a call away. Special alert: Patio Shades Retractable Awnings is offering a full 20 percent off on all on-line awnings purchases when you order with the discount code given on one of the image-rotator graphics on the front page of our Internet site, PatioShadesAwnings.com. This exclusive offer is available through 2016, but inquire with us at 908-259-4969 or 1-844-NU-PATIO for restrictions and details. Once you receive your custom awning, arbor or window/door shading, installation is almost literally a snap. You have the option of effecting the install yourself, or you can give us a call and we will put you in contact with a local professional with expertise in assisting you with the installation of your new Patio Shades awning. We provide the best service, deal with the best manufacturers and contract installers while offering the best selection of the best products – all of which goes to show why Patio Shades Retractable Awnings is Hand-Crafted, Above The Rest™.